Apex Solutions Review 2019: Is Apex Solutions a Good Hosting? Although lacking in some of the advanced features you’ll get from other providers, Apex Solutions does provide above-average shared hosting along with mailing list features for email marketing from your domain. 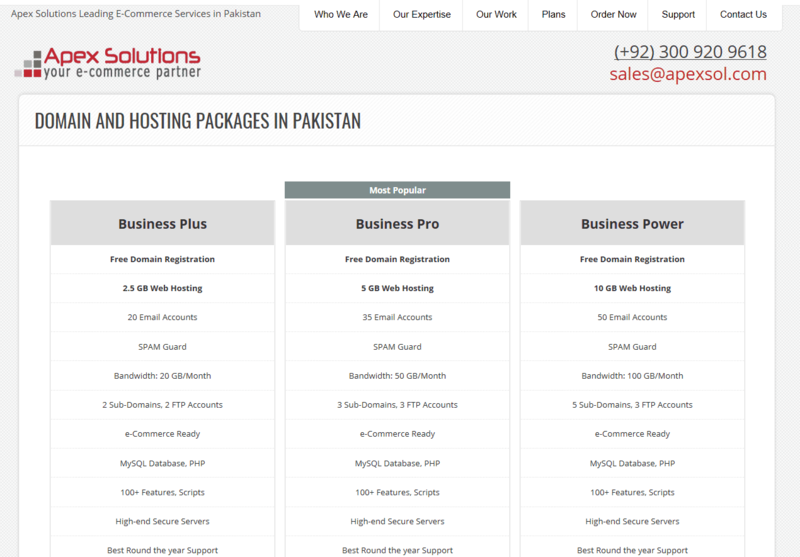 Apex Solutions is a Pakistan-based company that has provided high-end internet and e-commerce solutions since 2005. They offer shared hosting and plans for e-commerce and CMS sites. Their shared hosting services are slightly above average and are a viable option for those looking for a host that allows email marketing. The minimum bandwidth you get is 20 GB, which will support most websites with moderate traffic. For beginners, there is a one-click auto-installer for programs such as WordPress, but sadly no website builder. For everyone else, you can use FTP and cPanel to build your website. With this provider, you get support for mailing lists whereas most providers offer only basic email with an autoresponder. Apex Solutions offers five primary plans for their shared web hosting. Each of their single domain plans offers decent features. Which plan you choose will depend on whether you need to host large files, want more subdomains, or have higher traffic demands. Pricing for the Plus through Power plans is a bit cheaper than the average provider, but you must pay for a year in advance. You have to ask the provider for prices of the Premium and Pioneer plans. Apex Solutions can also help you build your personal, e-commerce or a CMS-backed website. Check their website for the prices of their design services. Apex Solutions offers solid support via phone, live chat, and email. However, only email support is available 24/7, with all other options being available from 9:30 am to 6:30 pm PST on Mondays through Saturdays. Also, note that live chat is done only through Skype. Apex Solutions is a solid provider if you’re looking for basic website hosting with plenty of bandwidth. They are also a good choice if you plan to use email marketing to promote your business. Wondering how Apex Solutions stacks up against other Web Hosting companies? Enter any other Web Hosting company and we will give you a side-by-side comparison.